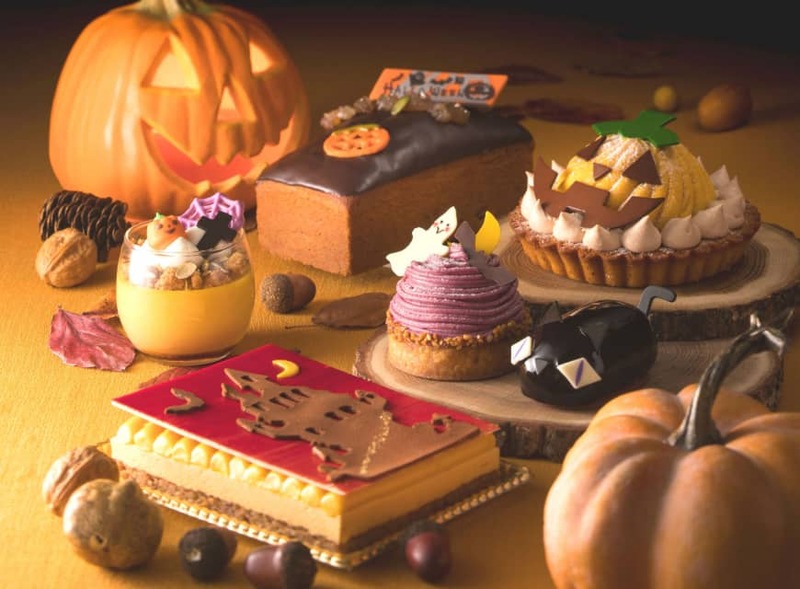 With Halloween on the horizon, the Cerulean Tower Tokyu in Tokyo’s Shibuya Ward is offering a Halloween Sweets Collection for everyone from children to adults to savor until Oct. 31. At the hotel’s pastry shop, six additional delectable cakes and pies are now available. Prices range from ¥594 to ¥2,268 depending on the size and serving of each dessert. New additions to this year’s lineup are a black cat chocolate cake and a Halloween pound cake with chestnut and pumpkin-flavored layers. Other desserts include pumpkin pudding, tarte au potiron (pumpkin pie), purple yam tart and caramel potiron. Whether it’s at a small family gathering or extravagant party with friends, the desserts are sure to be a highlight. In addition to the holiday selection, the pastry shop boasts a variety of hearty breads and original cakes. The shop also accepts advance orders for cakes celebrating anniversaries and other momentous occasions. The shop is open from 10 a.m. until 9 p.m. 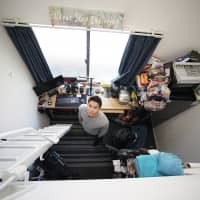 The Cerulean Tower Tokyu Hotel is five minutes from the West Exit of Shibuya Station. For more information or reservations, visit www.ceruleantower-hotel.com or call 03-3476-3000. In the mood for some Halloween afternoon tea? 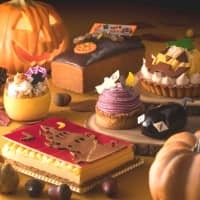 If so, go visit The Shangri-La Hotel, Tokyo to tuck into a spooky, yet playful collection of lavish treats. 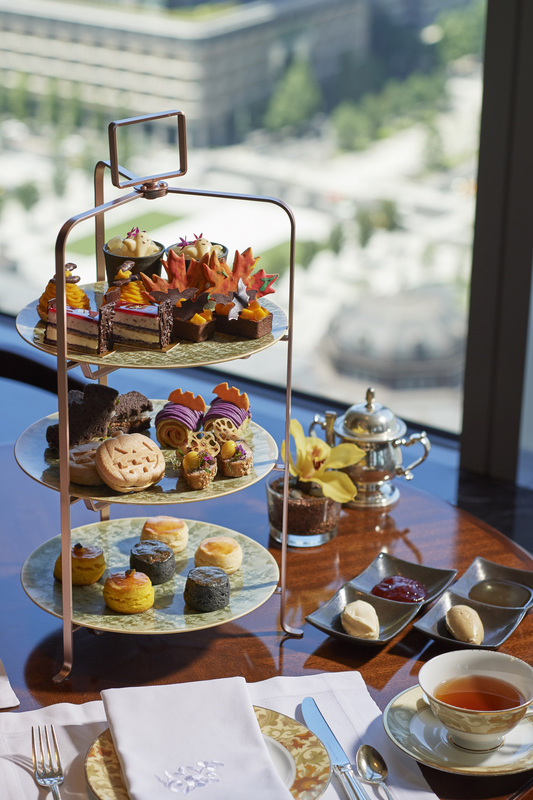 Through Oct. 31, an elegant afternoon tea fit for the season awaits guests at The Lobby Lounge, renowned for it beautiful atmosphere and stunning view overlooking Tokyo Station and the sprawling skyline beyond. The array of black and orange holiday desserts with splashes of purple are also spotlighting seasonal ingredients such as persimmons and pumpkins. This monstrously adorable afternoon tea includes a pumpkin Mont Blanc (sweet chestnut pastry) with a chocolate witch’s hat perched atop it, persimmon tart that combines the fruit’s gentle sweetness with custard cream and an opera cake made from figs and blueberries. Additionally, a milk chocolate mousse and pear compote topped with a cheerful white chocolate ghost is among the mix. On the savory side of the unique Halloween spread are a smoked salmon cream cheese wrap sandwich with purple yam, as well as jack-o’-lantern monaka wafers with a foie gras and pumpkin cream filling. The Shangri-La Hotel, Tokyo, is one minute from Tokyo Station’s Nihonbashi Exit. For more information and reservations, visit www.shangri-la.com or call 03-6739-7888. 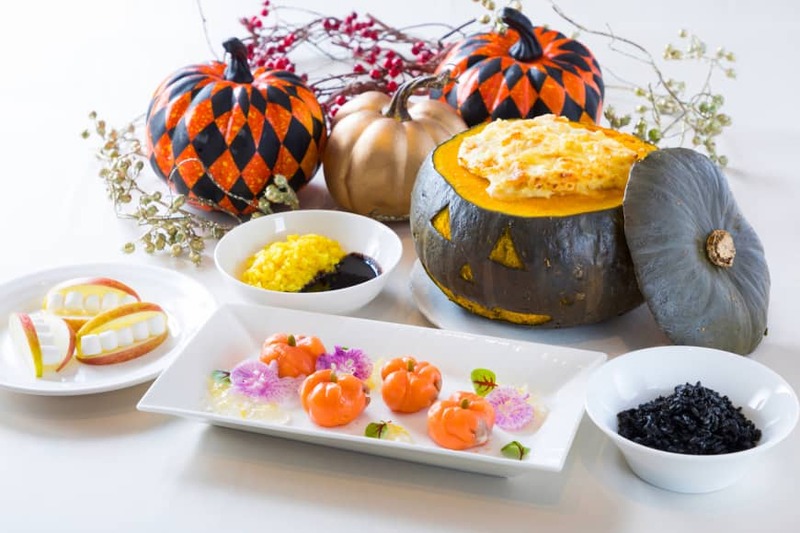 The Rihga Royal Hotel Hiroshima invites guests to try out its spooky Halloween promotion, which runs through Oct. 31. Featuring Halloween-themed meal plans and decorations, this collection of ghastly delights is perfect for getting into the Halloween spirit. The dinner buffet at the first floor All Day Dining Luore is laid out inside the mouth of a gigantic jack-o’-lantern. The buffet is only available for dinner, and features eerie photogenic dishes such as black curry and squid ink risotto (guests can choose one from a selection of main dishes). 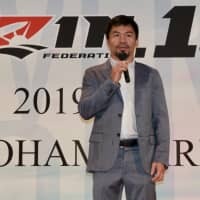 The buffet is limited to two hours between 5:30 p.m. and 9 p.m., and is priced at ¥3,300 for adults on weekdays and ¥3,800 (prices differ for primary school children and younger) on Saturdays, Sundays and holidays. Additionally, guests should not forget to visit the first-floor lobby photo spot, which is perfect for capturing the Halloween spirit and sharing with friends on social media. Big and small pumpkins and bats decorate the elevator halls and the front desk, allowing guests to get the most out of the hotel’s Halloween atmosphere. 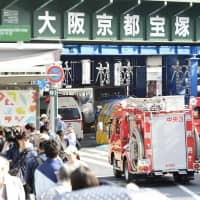 The Rihga Royal Hotel Hiroshima is accessible by bus from Hiroshima Airport, or a short walk from Kamiyacho-higashi or Kamiyacho-nishi stations. 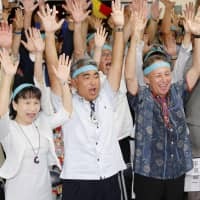 For more information, visit www.rihga.co.jp/hiroshima or call 082-502-1121.